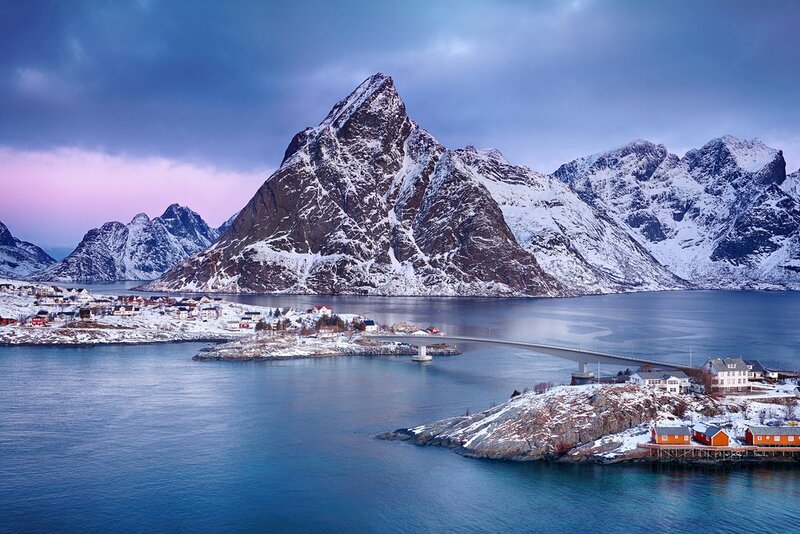 You could spend a whole year in Norway and barely scratch the surface of its expansive beauty. Try one of these comprehensive seasonal itineraries instead — you'll get acquainted with the country's nature, culture, and history in just two summer or winter weeks. Norway is a country for all seasons. With vast, varied landscapes and plentiful activities that suit any traveler's priorities, it's a destination that truly keeps on giving. The best part? Once you feel like you’ve done all there is to do in warm weather, you can simply go back in the cold months and experience it like new again. Here are two eye-opening itineraries that will inspire you to fall in love with Norway, no matter what time of year you go. 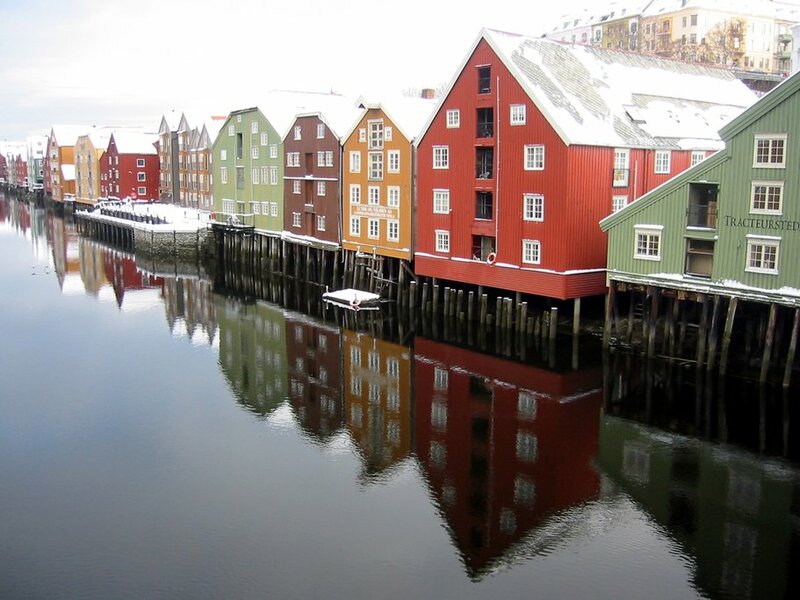 And for more trip ideas, see all of our 2-week Norway tours and itineraries. When the sun gently warms green pastures, and its rays glance off the surface of sparkling fjords, summer is the perfect time to experience southern Norway’s top nature spots and most exciting urban areas. This itinerary will take you to bustling cities, high points in the wild with jaw-dropping views, and glittering waterways edged by lofty peaks. You’ll get to know more about Norway’s culture and history, and better appreciate the bond Norwegians have with their beautiful land. Days 1 & 2: Arrive in Oslo and enjoy two full days to explore the Norwegian capital at your leisure. 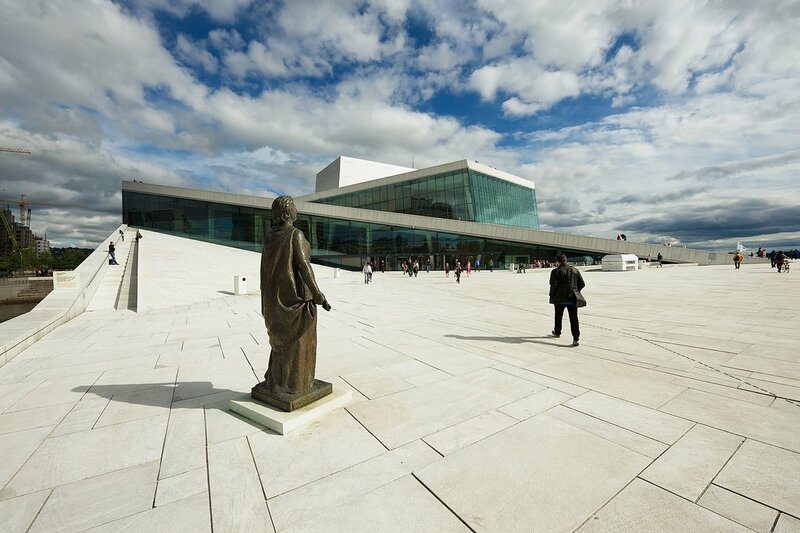 Be sure to check out historic buildings like the Royal Castle, City Hall, and Parliament, as well as contemporary gems like the waterside Oslo Opera House. The Edvard Munch museum celebrates one of the country’s most beloved artists, and the trendy Grunerløkka area has hip shops, quaint cafes and artisanal restaurants. Day 3: Board the train to a dynamic city on Norway’s southwest tip. Although the journey is over 7 hours long, this is no ordinary train ride: Sit back and watch the gorgeous coastal landscape of southern Norway glide past. 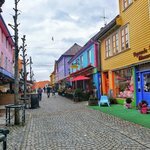 By evening you’ll be in Stavanger, and you'll have the chance to explore its picturesque narrow streets and charming white wooden houses before turning in for the night. Day 4: Once in Stavanger, you’ll have an astonishing number of natural sights at your fingertips, including the popular Lysefjord. Explore this waterway by kayak, or take a fjord cruise that edges along the shoreline for glimpses of rocky inlets and jagged peaks. 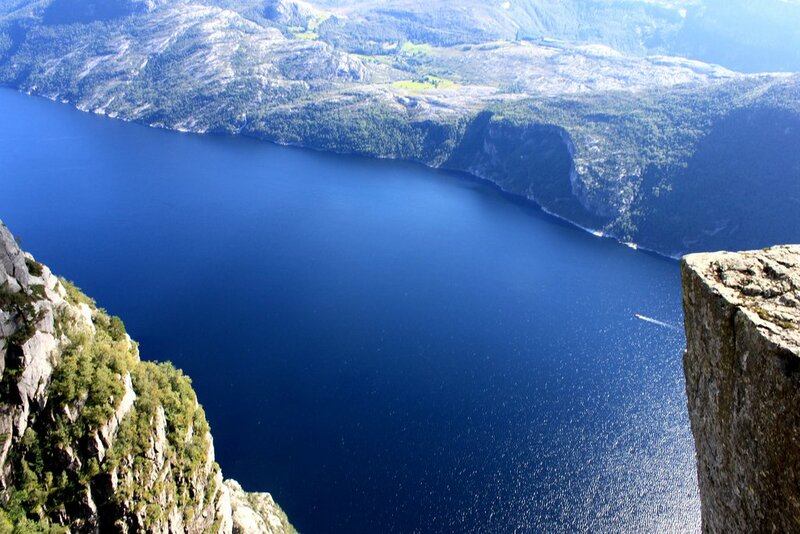 You can also view it from above, from two of the most famous lookout points in Norway: Preikestolen, a dramatic cliff plateau, or Kjeragbolten, an enormous boulder wedged between two cliffs. Days 5 & 6: From Stavanger, it’s another scenic 5-hour bus ride up the coast to Bergen, a city known for its enchanting, UNESCO-listed harbor area full of colorful wharfside houses, quaint shops and cafes, and Hanseatic history. You’ll have a full day to explore here, so make sure to stop by the lively fish market, check out a museum, and perhaps even hike up Mt. Fløyen (or take the famous funicular) for a view of the city from above. 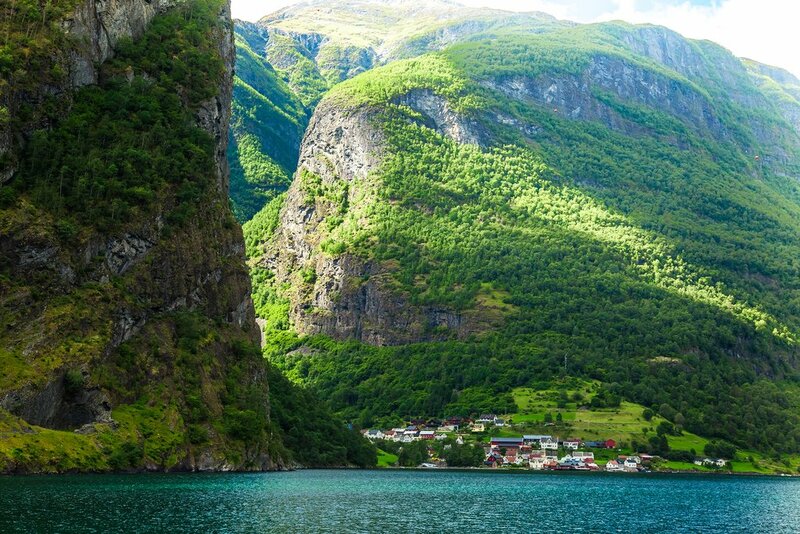 Days 7 & 8: A cruise to Balestrand will allow you ample time to marvel at the wonder of the fjords. This charming, picturesque town is set on the Sognefjord – Norway’s longest and deepest – and boasts a number of crafts shops and art galleries, as well as the Norwegian Travel Museum. With a full day here after the cruise, you’ll have enough time to explore the fjord by kayak or enjoy some scenic local hikes. Day 9: Head back to Bergen by way of Flåm to experience one of southern Norway’s most popular attractions: the quaint, old-timey Flåm railway, considered to be one of the steepest and most beautiful rail journeys in the world. Cross the fjord by boat to Flåm in time for lunch, pick up the Flåm railway to Myrdal for some incredible views, then arrive back in Bergen in the late afternoon. Days 10, 11 & 12: Board the Hurtigruten, Norway’s coastal steamer, to journey north with several scenic stopovers. 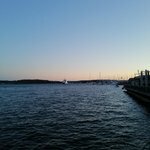 Your vessel will meander along the coast, taking you into majestic fjords and depositing you in quaint waterside towns. You’ll pass by several fjord waterfalls on your way to the village of Geiranger on the Geirangerfjord, and explore the art nouveau buildings at the center of Ålesund, a port town on the west coast. Day 13: Your Hurtigruten journey comes to an end in Trondheim, Norway’s 3rd largest city, where you’ll have the chance to explore restaurants and cafes, elegant streets and quaint harbor houses, and striking historic and contemporary buildings. Visit soaring Nidaros Cathedral as well as the grave of King Olav, who converted the Vikings to Christianity over 1,000 years ago. Day 14: Your train ride back to Oslo will allow you some time for rest, relaxation, and contemplation, as you once again take in Norway’s beautiful natural landscapes through the window. Tomorrow, it’s onward to your next flight or perhaps back home, but today you can savor the memory of unforgettable experiences in a new and fascinating place. If you think you know Norway, come back when the entire country is enveloped in white. With this itinerary, you can experience the hushed solitude of remote nature atop a wintry mountain peek, commune with reindeer on a magical sleigh ride, stay overnight in a traditional Sami tent, and of course, catch an unforgettable glimpse of the enchanting Northern Lights. 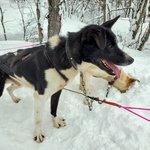 Days 1 & 2: Your journey starts in Tromsø, known as the “Paris of the North", and a fitting jumping-off point for all the Norwegian winter landscape has to offer. Hike up the nearest peak, Tromsdalstinden, for views of the region, or commune with locals at a number of bars and breweries. If you’re into contemporary architecture, visit the Polaria arctic aquarium, or learn about the history and culture of this region at the Polar Musuem and Tromsø University Museum. Day 3: Get acquainted with Sami culture in a trip out into the wilderness, where you’ll meet your chauffeur and vehicle for the evening: a reindeer and sleigh! After an invigorating ride, you’ll sleep over in a Sami lavvu (traditional tent) and take some time away from city lights to try to spot the aurora borealis. Days 4 & 5: You’ll have two days back in Tromsø to check out everything you may have missed, or simply relax and get cozy at your hotel as you ready yourself for an epic journey. 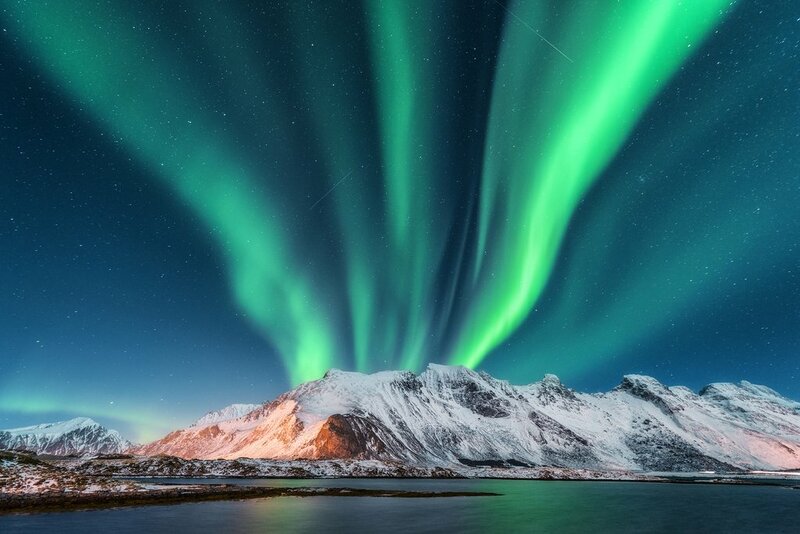 Just after midnight, you’ll board the Hurtigruten – Norway’s famed coastal steamer - for a 17-hour cruise up to the Lofoten Islands, with plenty of chances to glimpse the Northern Lights from the sea along the way. Day 6: Arriving in the town of Svolvaer in Lofoten, you'll check into your accommodations for the night: the traditional fishing cabins known as rorbuer. The charming, welcoming town is replete with galleries where artists exhibit works inspired by the area’s breathtaking nature, as well as several great restaurants making the most of unique local ingredients. 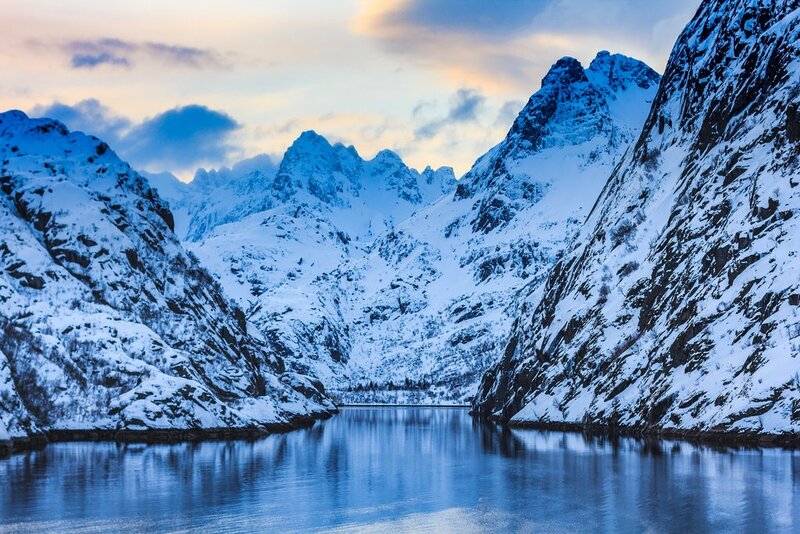 Day 7: Experience the natural wonders that make Lofoten come alive with a midday sea journey. You’ll pass through the straight of Øyhellsundet by boat to take in the spectacular Trollfjord, spot the eagles and seals that make a home in this area even under harsh Arctic conditions, and learn about the area’s one-time main industry with a visit to the whaling island Skrova. Day 8: You’ll be at sea again, but this time by the strength of your own paddles in an exhilarating kayaking tour. Dress warmly, get outfitted for your kayak, and get ready to take to the water for a different view of the coastline and – perhaps if you’re lucky – also the Northern Lights. Days 9 & 10: Take the chance to say goodbye to lovely Lofoten before boarding the Hurtigruten to Trondheim. 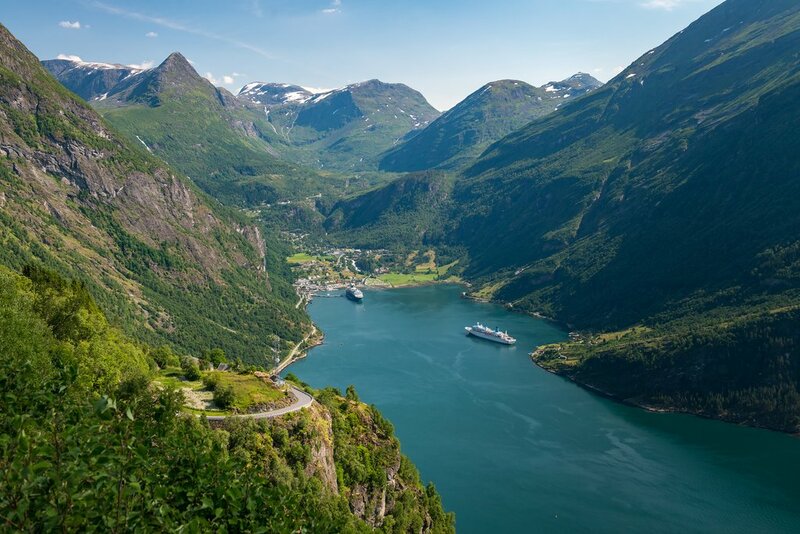 Relax on board and marvel at Norway’s unique coastline slipping by as the coastal steamer carries you southward. Day 11 Steam into Trondheim early in the morning and spend the day exploring. 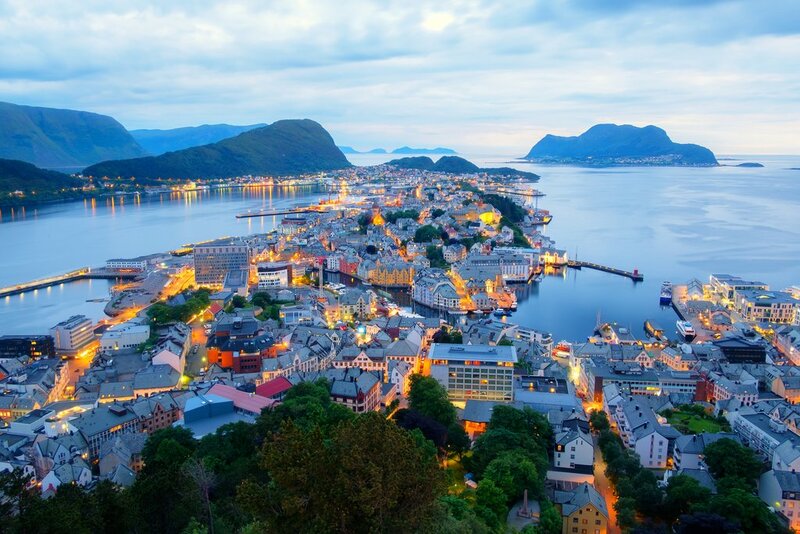 This cool, sophisticated coastal city is Norway’s 3rd largest, and offers a wealth of restaurants and cafes, elegant streets and quaint harbor houses, as well as enough historic and contemporary buildings to satisfy any architecture buff. Check out Nidaros Cathedral and pay your respects to the grave of King Olav, who converted the Vikings to Christianity over a millennium ago. Day 12 & 13: After breakfast, take a 3-hour train ride to UNESCO World Heritage Site Røros, a former mining town now dedicated to sustainability in tourism. Take a tour of the charming old town or go on a sleigh ride. If you’re here around the holidays, the snow and quaint buildings are sure to give you that fairytale Christmas feeling. Day 14: All aboard the train to Oslo! Enjoy the peace and calm on this 5-hour train ride as the sparkling white of Norwegian winter rushes past your window. Once checked into your hotel in the capital, you’ll be able to dine at one of the city’s celebrated restaurants. Don’t forget to toast to a fantastic two weeks of new places and unforgettable experiences in a true winter wonderland. Planning a trip with an in-country advisor just makes sense. Ingrid Thornes, our trip consultant for a two week trip in Norway, met and exceeded our expectations. Being from Bergen, she was able to give good first-hand advice and proved more reliable than a guide book. We outlined our preferences for types of hotels, modes of transport, and places we wanted to include on our visit. Ingrid evaluated our ideas, made suggestions and then delivered an itinerary that we collaborated on for weeks. That required a lot of patience from her! Honestly, this trip met ALL of our expectations because Ingrid took the time to listen and help us make good choices. All tickets were emailed, all connections made, paving the way for a knockout time in Norway. Well done KimKim. We will book another amazing excursion with your u again. It was a great trip. Ingrid was so thorough and available to us via email at any time. She was very prompt in responding to any inquiries we made and changes we requested. We thoroughly enjoyed the tour with her in Bergen as we were able to see areas we never would have discovered on our own. The hotels were lovely and centrally located which was so helpful to us. We are still raving about the wonderful breakfasts we enjoyed. Bergen was certainly a favorite. Balestrand was a real treat because of its size and location. We loved the kayaking and the trip up the fjord. It was a beautiful ferry ride up the Geiranger Fjord but it was spoiled a bit by the town, the cruise ships and the crowds. Of course, we were tourists just like all those people but we liked Balestrand better. Such a pretty town. Alesund was another favorite. The architecture, the small size of the city, the food, the hotel. All of it was great. Lofoten was unbelievable from start to finish. The looming wall as we arrived, the fisherman's cottages, the Viking Longhouse, the beaches. I think it was our favorite place. The Hurtigruten gave us a chance to relax for a couple of days but cruising is not really our thing. We preferred the ferries. But it was worth it to get to Lofoten. Even though we'd been warned, we had a little bit of a hard time getting adjusted to the prices in Norway. Overall, a wonderful trip and Ingrid was wonderful to work with.